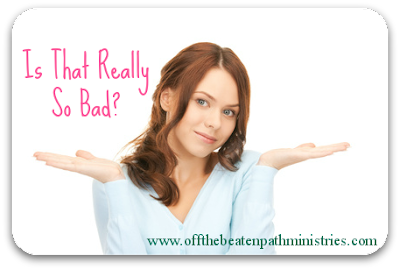 Off the Beaten Path: People Pleasing - Is That Really So Bad? People Pleasing - Is That Really So Bad? Let's face it. There are a few (maybe many) sins that we actually rationalize our way through...or so we think. I bet you can already think of a few. "Do not be fooled: People-pleasers do not love people. They love themselves. Only God-pleasers can truly love other people." Is People Pleasing Really All That Bad? "Well there are worst things I could do than try to please a few people!" he, he! "It's better than being callous and unfeeling towards others." humph! Jesus sought to please the Father, and Him alone. He did not seek to please the people who crowded around Him or the ones who avoided Him. He kept his focus singular: the Father. And because Jesus loved His Father and sought continuously to please Him, He also loved people. But He loved people enough to speak truth, to say "no," to walk away, to not bend, to be firm. Besides that, as 1Thessalonians 2:4 reminds us, God knows what's at the heart of our people-pleasing and, I beg your pardon, but it's not compassion and all sweetness. Are you guilty of people pleasing? Have you been excusing it as compassion, love and all things good? Well I hate to tell you this, but God isn't fooled. And quite honestly, people aren't either. There is a good and right way to truly love people. It begins by knowing how deeply you are loved by God and then develops more fully as you love God in return. Seek to love God with all your heart and soul and mind...then, with that big love pushing out all ulterior motives, turn and love the people in your life...with pure, godly love. What sins do you tend to candy coat and excuse? Let's talk about it.